Place the rice in a colander and rinse under cold running water for 5 minutes. Transfer to a small saucepan and add the water. Cover, bring to the boil and cook for 10 minutes. Remove from the heat, cover, and stand for 10 minutes. Combine the vinegar, sugar and salt. Spread the cooked rice over the base of a large flat shallow non-metallic dish and sprinkle with the vinegar mixture. Stir with a spatula for 5 minutes or until cool to touch. Line a 20cm x 30cm cake tin with plastic wrap. 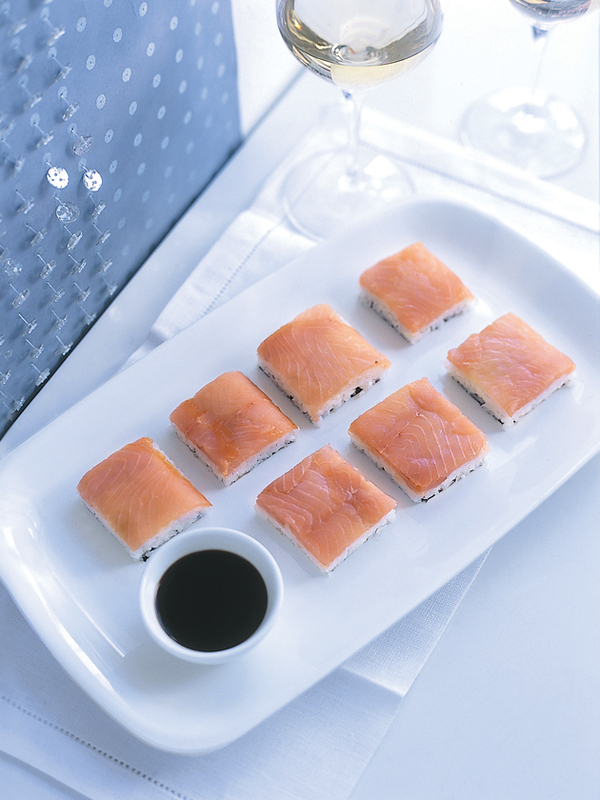 Line the base with smoked salmon, spread with wasabi, top with rice and press down firmly. Place nori over the sushi rice and fold over the plastic wrap to enclose. Place a piece of cardboard over the top and weigh down. Refrigerate for 1 hour. Turn out, slice and serve with soy sauce. Makes 30.